Book online and receive 50 points per person booked. Part of the Strada group, this neighbourhood Italian restaurant serves good quality, simple, freshly prepared Italian food in modern relaxed surroundings. The interior is contemporary and stylish with a 60s feel to it. Their traditional Italian menu has all your favourites including; pastas, risottos, grilled meat and fish dishes. Pizzas are cooked in a traditional wood-burning oven using time-honoured methods from the Amalfi region of Italy for that true authentic flavour. 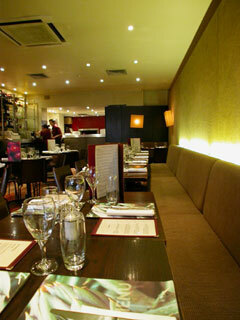 Strada has received favourable reviews from Time Out, Vogue magazines and The Guardian newspaper. This branch is vibrant and buzzy and a great place to go for a night out. Each table receives complimentary bottled water and delicious skinny bread sticks to nibble on as you wait for your meal. Service is friendly, professional and knowledgeable. The drinks list consists of purely regional Italian wines, beers and liquors which have all been carefully chosen to complement the menu. There's a private room downstairs perfect for parties, birthdays and family get-togethers. Group menu options are from the a la carte or set menu, although special requests will be met wherever possible. Good selection of handmade pastas and fresh sauces. Try the calamari, seafood risotto, fresh sea bream or any dish from their grill selection. Pizzas are hand stretched and cooked in a traditional wood-burning oven for an authentic flavour.